Would fiction be the same if Tolkien didn’t write The Hobbit? Would war be conducted the same if Napoleon didn’t become the military strategist he become? Would spirituality be the same if Buddha, Jesus and Krishna didn’t spread the wisdom they did? Would music be the same if Bach and Mozart hadn’t decided to play instruments? Would philosophy be the same if Socrates didn’t philosophize? Would martial arts in modern times be seen as it does if Bruce Lee hadn’t followed his dream? Would women see themselves as they do if Joan Of Arc wouldn’t have done what she did, at the age that she did it? Would modern morality be the same if Mother Theresa hadn’t carried out kindness as she had done, done the actions she undertook? Intriguing considerations to ponder. The answer to all the questions above is no, certainly not. History wouldn’t be the same at all. Those individuals serve as pillars for humanity. Change the actions of merely one of them, and you change history in its full breadth and scope. That shows you the power of the individual. That is incredible, resounding, incisive power; power that rarely ever gets the consideration it should. The actions of individuals echo into the future, into eternity. They change lives, they change circumstances, they change communities, they change nations, they create empires, they change history, they change everything. This is unprecedented power, incredible in every which way. One would think that empowering individuals – and showing how capable each of them can be – would be one of the staples of public schooling, or communities and societies in general. Such is not the case. The Individuals that are extolled, those that are usually always talked about, are usually seen from the perspective of a complete package, already done, whole cloth . Rarely if ever are individuals and the actions they took, the action they chose to take, ever spoken about at length. This is quite noteworthy because seeing the steps that individuals – particularly the pillars of society, the breakaway individuals above – and studying those quite consciously, and pondering them at length, could reap incredible rewards . At times, there are paths that individuals may walk through, paths that were paved before, paths that can be followed. At other times, there are paths waiting to be imagined, waiting to be created. 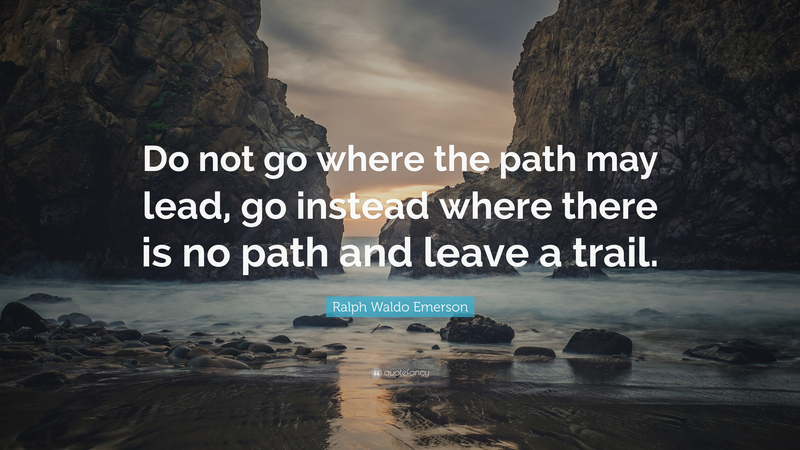 Those paths do not just appear out of nowhere; each of those historical paths, each of the actions individuals take, are taken via an endless series of choices. Choices so powerful and resounding that they create ripples and resonance in life’s field, echoing into the future, farther than you ever thought possible. Choices that create paths hitherto unknown, paths previously unimagined. That’s the very definition of a trail blazer. And trails are something that must be created. Individuals create them every single day. This is not an argument for or against war. I mention Napoleon because, whether you like him or not, he is an example of the fact that individuals change the course of history, one way or another. This notion came to me when having a conversation with someone last year. It struck me that, when discussing any particular individual, we as a society always get to see the complete products, the full versions of individuals, and that’s not unlike seeing the movie version of a book. The same way a movie will never hold everything a book did, such as The Hobbit, for example, an individual’s life is rarely ever seen through the full scope of their actions; rather, what we get is the shiny Hollywood version of what an individual became; the life of an individual is seen as all neat, polished, and in a finished form. That does a great disservice to the study of each of these individuals and others. This is a consideration that deserves a lot more rumination and will be expounded upon at length given the ramifications that it has for the study of the power of individuals and everything they have accomplished, do accomplish, and will accomplish in history. Why would I mention that these individuals mentioned are Breakaway Individuals? Because as individuals, each of the individuals mentioned, and many more, were incredibly ahead of their peers, in fact, sometimes generations ahead. Some of them were so far ahead that it could be argued they haven’t been topped, even now, millennia later. If that’s not the definition of a Breakaway Individual, nothing is. A notion to be pondered more in depth in the future, as it serves as the very foundation for this blog.